In their analyses of the role of women in politics, political scientists had tended to neglect the family and the labour market, thus ignoring a crucial aspect of women’s political activity. Originally published in 1981, this book shows that the family and the labour market are political institutions directly relevant to the distribution of power and to economic and social development. Because the political functions of these two institutions are ignored, political systems are misunderstood with serious consequences for the implementation of policy. The studies in the book, which relate to widely different political systems and which cross disciplinary boundaries, all concentrate on the crucial activities of women. They serve to increase our understanding of the political implications of the family, of the sexual divisions of both domestic and wage labour and of the role of education in these inequalities at the time. They show the fundamental comparability of the problems posed by patriarchy as well as the diversity of their manifestations in different political and economic systems. Further, the studies show an unexpected dependence of male-dominated institutions, such as the military and high technology, on women’s traditional gender roles. Ways of empowering the powerless through law, political activity and employment are also discussed. By extending the scope of discussion, this book is a valuable contribution to our understanding of politics and of the centrality of women to political structures. List of Tables. List of Figures. Preface. Acknowledgments 1. 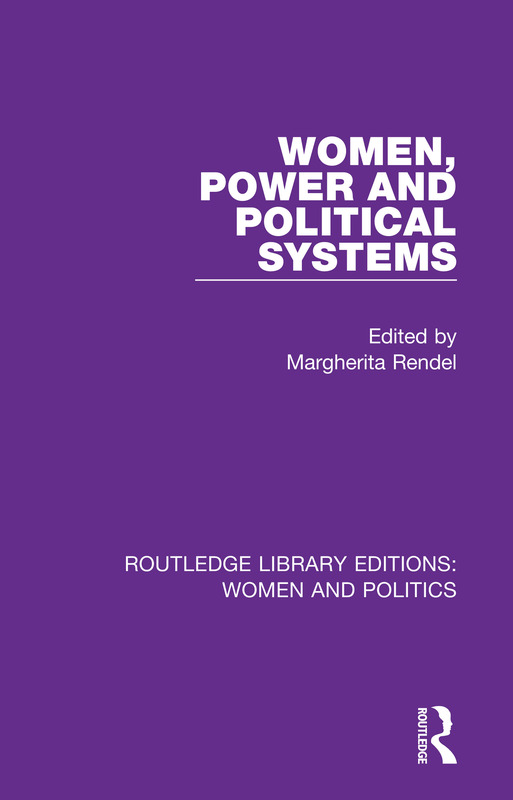 Women, Power and Political Systems Margherita Rendel 2. Women and Citizenship: Mobilisation, Participation, Representation Judith Stiehm 3. Women’s Role in the Formulation of Public Policies in Brazil Fanny Tabak 4. Women’s Education and Participation in the Labour Force: The Case of Nigeria Keziah Awosika 5. Women in Government as Policy-makers and Bureaucrats: The Turkish Case Nermin Abadan-Unat 6. Creating Employment Opportunities for Rural Women: Some Issues Affecting Attitudes and Policy Najma Sachak 7. Demography, Political Reform and Women’s Issues in Czechoslovakia Sharon L. Wolchik 8. A Hard Day’s Night: Women, Reproduction and Service Society Ilona Kickbusch 9. Technology, ‘Women’s Work’ and the Social Control of Women Joan Rothschild 10. Women’s Employment Networks: Strategies for Development Jeanne Marie Col 11. The Impact of the Women’s Movement and Legislative Activity of Women MPs on Social Development Sirkka Sinkkonen and Elina Haavio-Mannila 12. Will Women Judges Make a Difference in Women’s Legal Rights? A Prediction from Attitudes and Simulated Behaviour Beverly B. Cook 13. Future Perspectives Margherita Rendel. Appendixes. Notes on Contributors. Index.